Leigh and Tony are a unique couple in many ways. How many people do you know who had their first date in a police car?! And who would have ever thought that a police car could become a romantic environment. Tony is a police officer in Durham and he and Leigh have been friends for many years. They met in the tenth grade. About a year ago the friendship started deepening and Tony asked her to go with him for a “ride-along” while he was on duty. Leigh accepted this unusual offer and - as she puts it - she got into the car a friend but came out a few hours later as a girlfriend. I love their story. 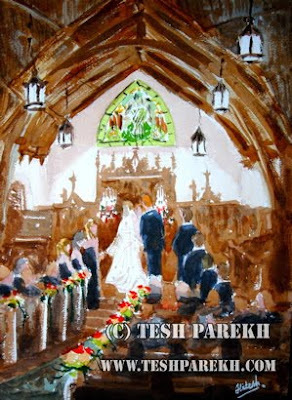 They hired a local artist, Tesh Parekh, to do paintings of the wedding and reception while they were actually happening. A reproduction of Tesh’s wedding painting is included here by his kind permission and the original is sure to become a beloved keepsake in Leigh and Tony’s home. If you would like Tesh to do the same for your wedding - or any other important function - you can contact him through this link. 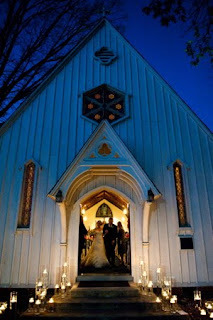 The wedding was held in the wonderful old St. Mary’s Chapel on the campus of St. Mary’s School in Raleigh. 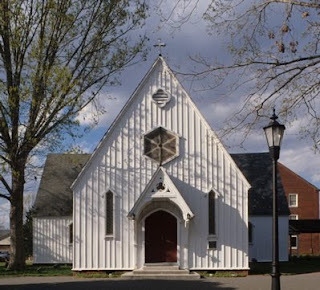 Built in 1852 and still an active church to this day, it is on the National Historic Register and has a distinctive old-world charm. The chapel is really quite special and it is much larger inside than what the exterior would lead you to believe. It has a palpable spiritual feeling from the 157 years of prayer and human emotions that have taken place within its walls and I found that to be very comforting. This was the first wedding I had ever done there and I will be looking forward to more in the future. I guess you could say I fell in love with it as much as Leigh and Tony and it was absolutely perfect for the religious sincerity of the ceremony we had worked together to create. 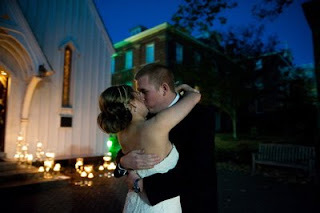 Here is a photo of the chapel, taken by Michael Zirkle Photography. 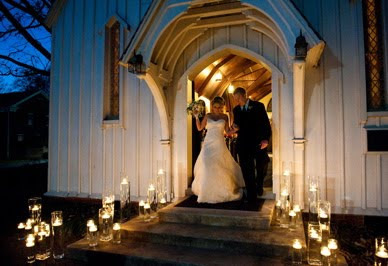 Leigh and Tony had set out clear glass vases of water and candles all around the entrance and along the walkway as you approached the front. The vases were of differing shapes and sizes, with floating white candles lit in every one. With dusk upon us, the flickering candlelight was reflecting in the water and glass and combining with the rich, warm glow of the church interior coming through the open doors. It made for a magical setting right out of Hollywood. As Leigh stood in the doorway to make her entrance, the outside light was shining on her perfectly and her veil took on a beautiful glow around her. Yes, this was a magical wedding indeed. Leigh and Tony very wisely chose Cara Zeulke of A Southern Soiree as their wedding planner. She and her assistants made sure everything was handled with efficiency and kindness, which is part of why Cara is so successful in her work. And why I always enjoy working with her so much. On hand to photograph the event was Shane Snider. He has an eye for the unexpected and unusual and his rapid-fire trigger finger allows him to get some very creative shots. 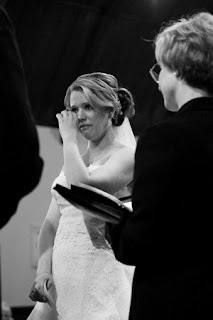 All the beautiful photos in this post were provided by Shane (thanks, Shane), including this touching one of Leigh as she was listening to Tony speak the beautiful vows he had written to her. His vows were so tender and heartfelt that I don’t know how she managed to read the equally beautiful vows she had written to him when it was her turn. What a moving photo this is of love given and returned. The artful flowers decorating the church and carried by Leigh and her Bridesmaids were provided by Fresh Affairs. I have seen their work many times before and it is always beautiful. Cara calls them “floral genius” and they certainly are. Leigh and Tony, you were both aglow in your love for each other and your hopes and dreams for your future. I know you will have many wonderful times ahead - and may all your dreams come true.